We are reaching the time of the year when the whole Christian world is preparing to celebrate the most noted of its solemnities – the birth of the Founder of their religion. When this paper reaches its Western subscribers, there will be festivity and rejoicing in every house. In North Western Europe and in America the holly and ivy will decorate each home, and the churches bedecked with evergreens; a custom derived from the ancient practices of the pagan Druids “that sylvan spirits might flock to the evergreens, and remain unnipped by frost till a milder season”. In Roman Catholic countries large crowds flock during the whole evening and night of “Christmas-eve” to the churches, to salute waxen images of the divine Infant, and his Virgin mother, in her garb of “Queen of Heaven”. To an analytical mind, this bravery of rich gold and lace, pearl-broidered satin and velvet, and the bejewelled cradle do seem rather paradoxical. When one thinks of the poor, worm-eaten, dirty manger of the Jewish country-inn, in which, if we must credit the Gospel, the future “Redeemer” was placed at his birth for lack of a better shelter, we cannot help suspecting that before the dazzled eyes of the unsophisticated devotee the Bethlehem stable vanishes altogether. To put it in the mildest terms, this gaudy display tallies ill with the democratic feelings and the truly divine contempt for riches of the “Son of Man”, who had “not where to lay his head”. It makes it all the harder for the average Christian to regard the explicit statement that – “it is easier for a camel to go through the eye of a needle, than for a rich man to enter the kingdom of heaven”, as anything more than a rhetorical threat. The Roman Church acted wisely in severely forbidding her parishioners to either read or interpret the Gospels for themselves, and leaving the Book, as long as it was possible, to proclaim its truths in Latin – “the voice of one crying in the wilderness”. In that, she but followed the wisdom of the ages – the wisdom of the old Aryans, which is also “justified of her children”; for, as neither the modern Hindu devotee understands a word of the Sanskrit, nor the modern Parsi one syllable of the Zend, so for the average Roman Catholic the Latin is no better than Hieroglyphics. The result is that all the three – Brahmanical High Priest, Zoroastrian Mobed, and Roman Catholic Pontiff, are allowed unlimited opportunities for evolving new religious dogmas out of the depths of their own fancy, for the benefit of their respective churches. To usher in this great day, the bells are set merrily ringing at midnight, throughout England and the Continent. In France and Italy, after the celebration of the mass in churches magnificently decorated, “it is usual for the revellers to partake of a collation (reveillon) that they may be better able to sustain the fatigues of the night”, saith a book treating upon Popish church ceremonials. This night of Christian fasting reminds one of the Sivaratree of the followers of the god Siva, – the great day of gloom and fasting, in the 11th month of the Hindu year. Only, with the latter, the night’s long vigil is preceded and followed by a strict and rigid fasting. No reveillons or compromises for them. True, they are but wicked “heathens”, and therefore their way to salvation must be tenfold harder. Though now universally observed by Christian nations as the anniversary of the birth of Jesus, the 25th of December was not originally so accepted. The most movable of the Christian feast days, during the early centuries, Christmas was often confounded with the Epiphany, and celebrated in the months of April and May. As there never was any authentic record or proof of its identification, whether in secular or ecclesiastical history, the selection of that day long remained optional; and it was only during the 4th century that, urged by Cyril of Jerusalem, the Pope (Julius I) ordered the bishops to make an investigation and come finally to some agreement as to the presumable date of the nativity of Christ. Their choice fell upon the 25th Day of December, – and a most unfortunate choice it has since proved! It was Dupuis, followed by Volney, who aimed the first shots at this natal anniversary. They proved that for incalculable periods before our era, upon very clear astronomical data, nearly all the ancient peoples had celebrated the births of their sun-gods on that very day. “Dupuis shows that the celestial sign of the VIRGIN AND CHILD was in existence several thousand years before Christ” – remarks Higgins in his Anacalypsis. As Dupuis, Volney, and Higgins have all been passed over to posterity as infidels, and enemies of Christianity, it may be as well to quote, in this relation, the confessions of the Christian Bishop of Ratisbone, “the most learned man that the middle ages produced” – the Dominican, Albertus Magnus. “The sign of the celestial Virgin rises above the horizon at the moment in which we fix the birth of the Lord Jesus Christ” he says, in the Recherches historiques sur Falaise, par Langevin prêtre. So Adonis, Bacchus, Osiris, Apollo, etc., were all born on the 25th of December. Christmas comes just at the time of the winter solstice; the days then are shortest, and Darkness is more upon the face of the earth than ever. All the sun Gods were believed to be annually born at that epoch; for from this time its Light dispels more and more darkness with each succeeding day, and the power of the Sun begins to increase. However it may be, the Christmas festivities, that were held by the Christians for nearly fifteen centuries, were of a particularly pagan character. Nay, we are afraid that even the present ceremonies of the church can hardly escape the reproach of being almost literally copied from the mysteries of Egypt and Greece, held in honour of Osiris and Horus, Apollo and Bacchus. Both Isis and Ceres were called “Holy Virgins”, and a DIVINE BABE may be found in every “heathen” religion. We will now draw two pictures of the Merrie Christmas; one portraying the “good old times”, and the other the present state of Christian worship. From the first days of its establishment as Christmas, the day was regarded in the double light of a holy commemoration and a most cheerful festivity: it was equally given up to devotion and insane merriment. “Among the revels of the Christmas season were the so-called feasts of fools and of asses, grotesque saturnalia, which were termed ‘December liberties’, in which everything serious was burlesqued, the order of society reversed, and its decencies ridiculed” – says one compiler of old chronicles. During the Middle Ages, it was celebrated by the gay fantastic spectacle of dramatic mysteries, performed by personages in grotesque masks and singular costumes. The show usually represented an infant in a cradle, surrounded by the Virgin Mary and St. Joseph, by bull’s heads, cherubs, Eastern Magi, (the Mobeds of old) and manifold ornaments. 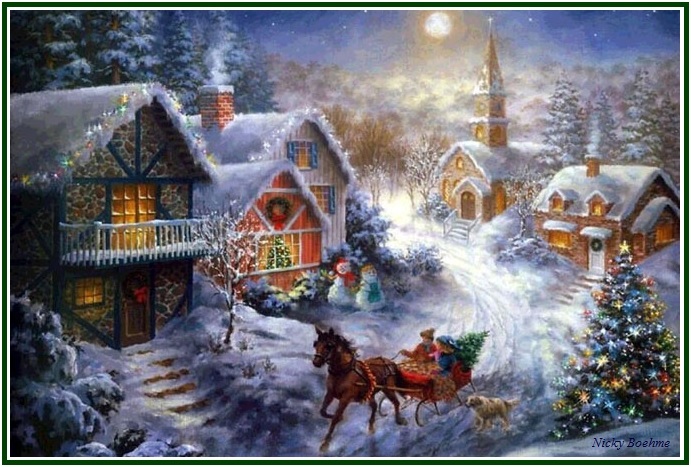 The custom of singing canticles at Christmas, called Carols, was to recall the songs of the shepherds at the Nativity. “The bishops and the clergy often joined with the populace in carolling, and the songs were enlivened by dances, and by the music of tambours, guitars, violins and organs. . .” We may add that down to the present times, during the days preceding Christmas, such mysteries are being enacted, with marionettes and dolls, in Southern Russia, Poland, and Galicia; and known as the Kalidowki. In Italy, Calabrian minstrels descend from their mountains to Naples and Rome, and crowd the shrines of the Virgin-Mother, cheering her with their wild Music. Originally published in “The Theosophist”, December 1879, the above article is included at “Theosophical Articles”, H.P. Blavatsky, Theosophy Co., Los Angeles, 1981, vol. III, pp. 58-62.